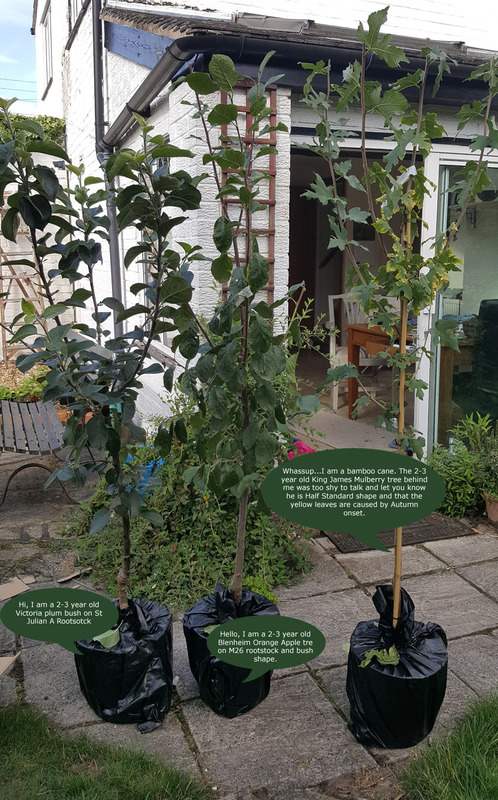 All our bare root Blenheim Orange Apple trees are good for eating, storing and cooking and is considered by many to be one of, if not the best dual purpose apple. We tried to locate "many" to confirm this observation but directory enquiries had no listing, Yell.com returned a "no results" page and asking random people in the high street got us escorted out of the area. The apples are large with a nutty taste and a crumbly texture and are good for cooking and eating. The RHS though this tree was that good, they gave it the Award of Garden Merit. This should have been because of its outstanding characteristics and not because it bribed someone on the board! The Blenheim Orange apple tree is good for growing in containers, by that we mean suitable tree containers not margarine tubs, grandads old slippers and the bath. Month Of Fruiting: Early October and they will keep until January. Fertility: (C3) TRIPLOID NOT SELF-FERTILE. Requires 2 other apple trees in group C2,C3 or C4 close by to produce fruit. 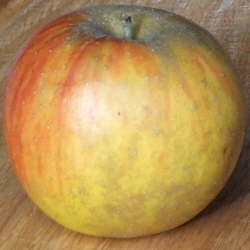 Ideally purchase a self-fertile apple tree in pollination group C3 e.g Red Falstaff. Tip Bearing: This means that all the fruits are found at the end of each branch, so don't go cutting them off unless you have to. Click the link for more detailed information about apple tree triploid pollination. 1kg/2¼ lb cooking apples, peeled, cored (the chewy leathery bits in the middle removed) and sliced. 50g/2oz butter, melted, plus a bit extra for greasing and flicking at the kids as they run past. 2. Get a heavy based saucepan, practice a few tennis serves with it or put it on your head and pretend to be a helmet wearing soldier firing at aliens. Everything after get a heavy based saucepan is only essential if you have kids around or never mentally passed 12 years old. 3. Put the apples, sugar, cinnamon, lemon zest and juice into the tennis racket/helmet and pretend it is a saucepan for a minute. If you don't know what zest is, it is the outer skin of the lemon without the white stuff (pith) attached to it. A potato peeler is good for removing the zest but angle it so that minimal pith is removed. Do not be sarcastic while removing the white stuff otherwise this is "taking the pith". 5. Remove the lid and turn up the heat to high. Beat the apples like you just found them vandalising your pride and joy until the liquid has evaporated and you have formed a puree or for the simple ones amongst us, a paste. 6. Which ever way you choose, the bread needs melted butter on both sides. Throwing frisbee style is more fun, less accurate, at the melted butter container. 7.Lightly smear butter into a 15cm or 6inch (which ever is bigger) diameter cake tin and cover the base and sides with 3/4, 75% or a big chunk of the bread. Ensure there are no gaps in between the slices and make the sides come up a little bit over the top. 8.Put the paste, puree, Ecto-plasm or contents of your helmet/tennis racket over the bread and cover with the rest of the bread making sure there are no gaps. 9.Turn or fold down the bread lining the sides of the tin and press down onto the bread on top to make a lid. 10. Bake for 30 minutes, half an hour or until golden-brown.